Basically some of our enemies aren’t extending from BP_BaseEnemy – for example Spider. That’s why I have decided to create different way to decide if Actor should be targeted by Turret. I will use scene component for this. Each actor that have this component will be targeted by turret. Additionally component will tell turret where to aim. 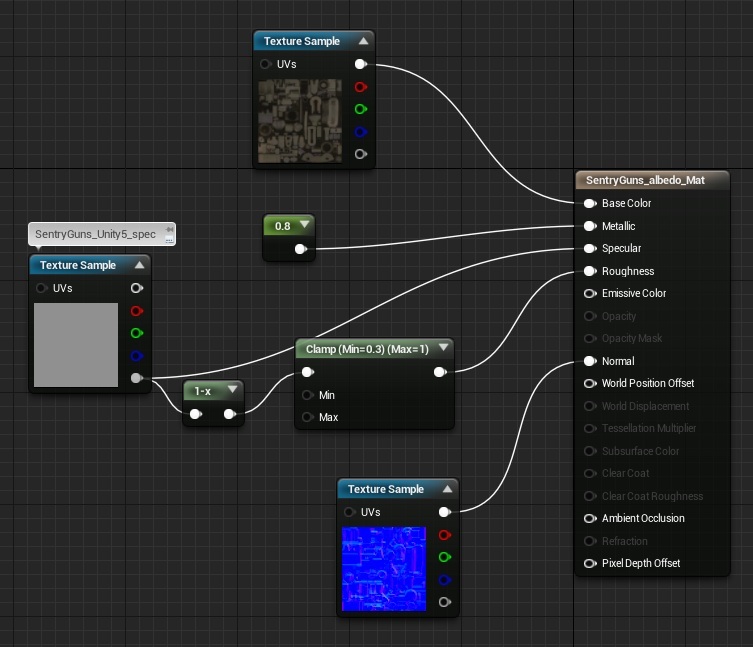 Create new blueprint extending from SceneComponent. Name it TurretTargetComponent. Add one bool variable: isDead and one function SetIsDead which will set isDead bool. 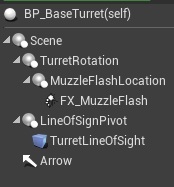 Now open BP_BaseEnemy and add TurretTargetComponent to it. Do the same for every actor that you would like to target with Turret. My plan is to create one base class which turrets will extend from. Please create new Blueprint extending from Actor. Name it BP_BaseTurret. This will be pivot for rotating turret. Will spawn projectiles from this location. 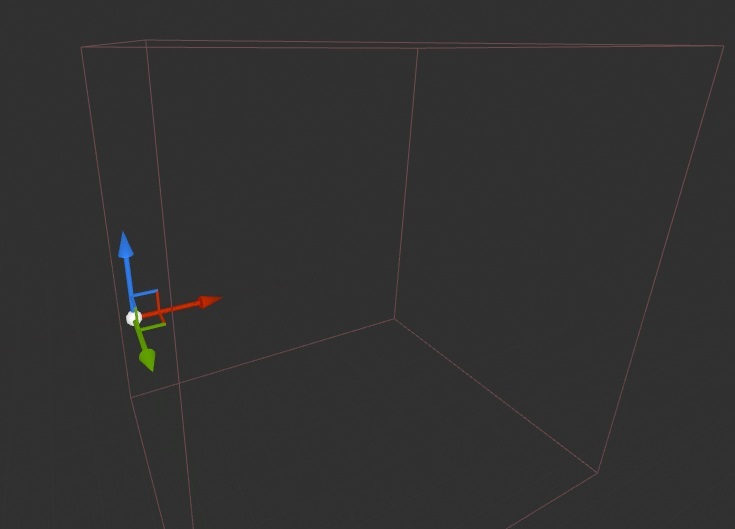 FX_MuzzleFlash – Particle System Component. Make sure AutoActivate is set to False. This will be just muzzle flash effect. Basically when you scale this TurretLineOfSign Box component will scale as well. It will be used for deciding what’s the distance of turret. Will check all overlaping actors with this box. Why I’m messing with Location here? Because I would like to have LineOfSightPivot scale to update the Box collision. 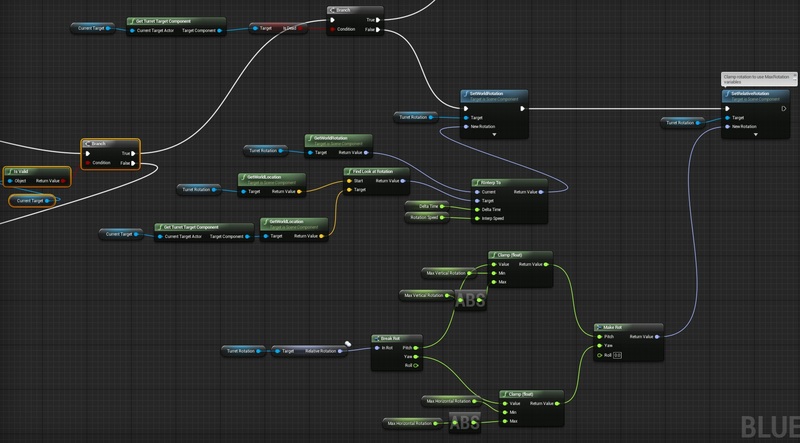 Now you can mess with LineOfSightScale float variable and you will see what I mean. This is helper function which will return TurretTargetComponent for requested Actor. 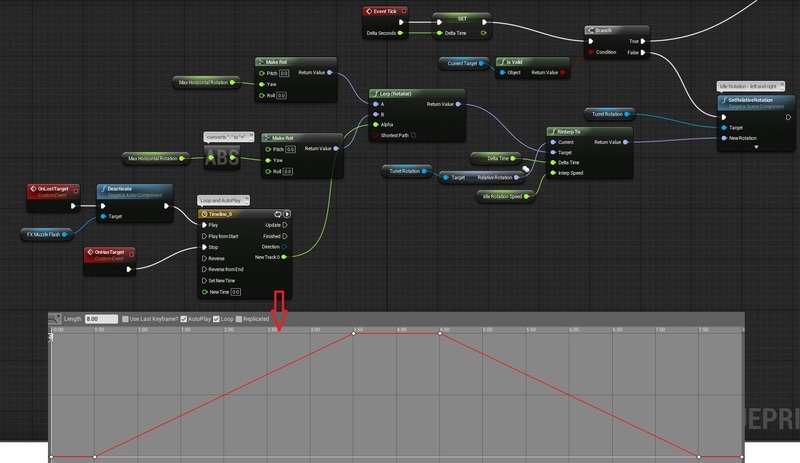 This is checking for all overlaping actors if there is actor that have TurretTargetComponent and isn’t dead. If yes – return this actor. First I will focus on idle left right animations. This should be straightforward for you guys. If turret don’t have target just rotate left and right. Now if we have an target but the target isn’t dead let’s rotate to target. The last part is to clamp maximum rotation so you could create turret which can only aim up by 5 angles. This is only looking complicated but it’s really easy. Now what if we have target but the target is dead? We need to check if there is another target in Box Collision. So basically it’s checking if something is overlapping with box collisoin – if yes – assign new target. That’s all in Tick. And that’s almost all behavior of the Turret. Simple: check if we have target – fire with spread, wait, and fire again. The last thing to make this working is to create OnBeginOverlapp event from TurretLineOfSight Box Collision component. This event starts everything. Now we have our base and we can start creating Turrets! I will use Sentry Guns package. Create new Blueprint extending from BP_BaseTurret. 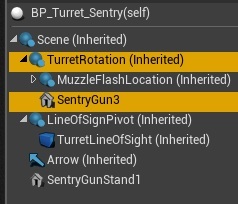 Name it BP_Turret_Sentry. Add new Static Mesh Component from SentryGun3 static mesh. Attach the component to TurretRotation. 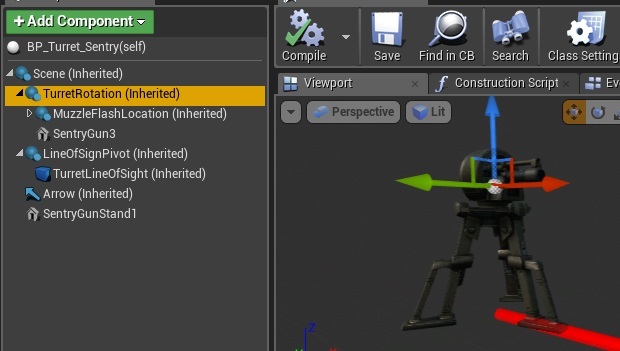 Add new Static Mesh Component from SentryGunStand1 – don’t need to attach it to anything. Before we move to variables let’s create new Projectile for this Turret. Create new blueprint extending from BP_BaseProjectile. Name it SentryProjectile. Add one new Particle System component from P_AssaultRifle_Tracer_01 which can be found in Military Weapons Silver package. Open back BP_Turret_Sentry again and assing your Projectile. That’s all guys! As always take your time and play with the blueprints! Havent started working with your tutorials yet but i will soon. Just wanted to let you know that i really appreciate all the hard work you put into this. could really use a working turret, but i cant blueprint. Next PostNext Poll result: Which Android device you are using?